Recently, men in the government have been trying to make permanent decisions about women’s healthcare in America, and it’s not settling with women. Birth control, abortions, gynecologist appointments, tampons and pads: a list of items that could be in jeopardy. Now, while most women can name multiple healthcare items they need, there are plenty of men in women’s lives that would not even be able to figure out what type of pads are needed for their period. Men do not experience the same physical struggles and maintenance for self-care as women so they shouldn’t get to dictate the decisions of how women want to take care of themselves. The Trump Administration proposed a policy that would interfere with women’s birth control but has luckily been turned down by Judge Haywood Gilliam in California. According to The New York Times, The new restriction that Trump wants to add to Title X, a federal program dedicated to family planning health services, would have allowed employers in 13 states and Washington D.C. to deny coverage for contraceptives, meaning that thousands of women could lose their coverage for birth control. The idea of having a policy such as this pass is absolutely ridiculous. Birth control is helping women in more ways than people can imagine. It is used to treat ovarian cysts, reduce acne, painful cramps, excessive bleeding during a woman’s menstrual cycle, and reduces the risk of ovarian cancer and amenia. 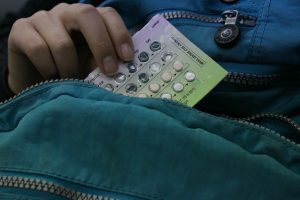 According to the Center for Disease Control, birth control has reduced the rate of teen pregnancies in the United States to 22 per 1,000 females in 2015, wherein 1990 it was 118 per 1,000 females. Evidence suggests that teen pregnancies have reduced due to the accessibility of contraceptives. The idea that women would not be able to afford their medicine because of the Trump Administration allowing employers to deny contraceptive coverage is terrifying. Contraceptives can be expensive without insurance, reaching over $100. Why do men, who do not go through any of the pain that women endure involving their uterus, get to choose how we manage to take care of our bodies, let alone if we even can take care of them? If the Trump Administration believes that birth control is a financial burden to insurance companies and employers, it would be interesting to know how insurance companies and employers plan to pay for the numerous amount of doctor visits for unplanned pregnancies. While Trump Administration also says that the restriction would be for employers to deny coverage based on religious or moral grounds, this is why church and state are separated. It would take away the right for women who have different beliefs, to have accessibility to their birth control. Very few women think having their period is a luxury. Women all over the country pay for menstrual products, and in 40 states, women need to pay a tax because they are not seen as a necessity, yet many household remedies at the grocery stores are not taxed in Florida. Menstrual products are seen as luxury goods, which causes the prices to rise which can make it a struggle for women living in poverty to afford them. As women, there is not a single thing we can do about our period; it comes every month and can stay for 5-8 days. We cannot cancel our periods unless we want a surprise nine months later. Women need menstrual products, it is not a luxury. Why should we be taxed as if it is one, yet Viagra isn’t? The U.S. Department of Defense spent 41.6 million dollars on Viagra in 2014 for the troops and family members on the military healthcare plan according to the Military Times. Viagra is not taxed because it is a medication for those with erectile dysfunction, but while those with erectile dysfunction need Viagra, women need menstrual products. The Trump Administration is also trying to pass what is called the “gag rule,” where doctors nationwide would not be able to give recommendations regarding abortions. For example, if a woman found out she was pregnant and asked her doctor where she could get an abortion, her doctor would not be able to tell the patient what center performs abortions. Another example is if a woman’s pregnancy affects her health negatively, her doctor might not recommend abortion or be informed that abortion is as an option. There are plenty of women in this country who are pro-choice, and there are also plenty of women who have been put in a position where their pregnancy puts them at risk. While every woman has their own choice and beliefs that are respectable, abortion is still a medical option and procedure that can save a woman’s life as well as help a woman in a difficult place of bearing a child. Women should know all of their viable options available to them involving their health. An added note is that “hiding” abortions will not stop abortions, it will only increase unsafe abortions. In Venezuela, where abortions are illegal, unsafe abortions are the second highest killer of women from ages 12-49. Now while the gag rule will not make abortions illegal, it will make it more difficult for women to make a choice about their own health which can raise the numbers of unsafe abortions. Women are being hushed with our rights involving our healthcare. Women deserve to have all the options available to them. Women deserve their birth control the same amount that men deserve condoms. Men should not control how the female body is taken care of.